But what is unique about Bloomberg Place is that from 2017 visitors will be able to see the remains of a Roman temple dating from the 3rd century AD. 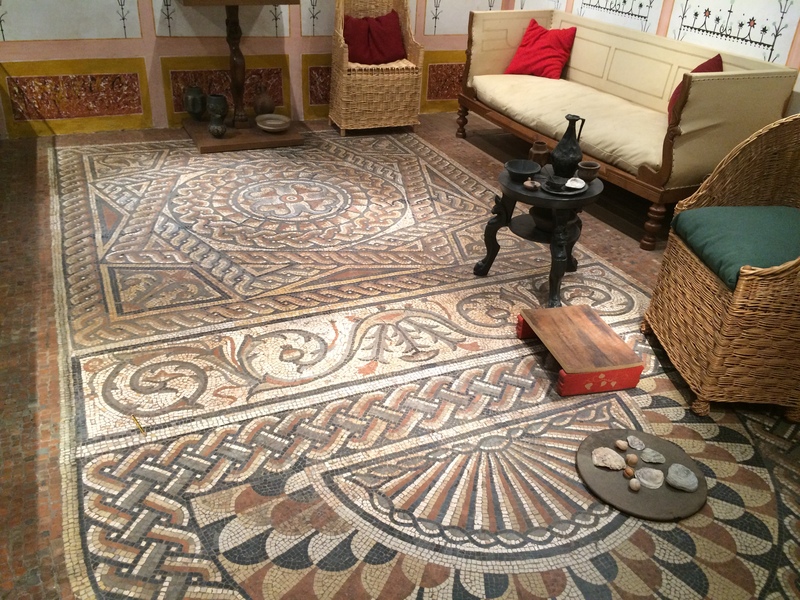 The museum – which will have its own entrance – will also display some finds unearthed at the site in recent years giving a tantalisingly fresh glimpse into everyday life in Roman London. The Temple of Mithras was first discovered by archaeologists in 1954, digging ahead of the construction of a new building in the aftermath of the Blitz. Some 30,000 people queued every day to see the site where the whole ground floor of the religious building had survived. But following the demolition of the ghastly post-war structure to make way for Bloomberg Place, Mithras is on course to return to return to its original position. The whole project is proving to be no mean feat as 4,500 individual pieces needed to be packed up for the move, but history enthusiasts believe the move will be worth it in the end. 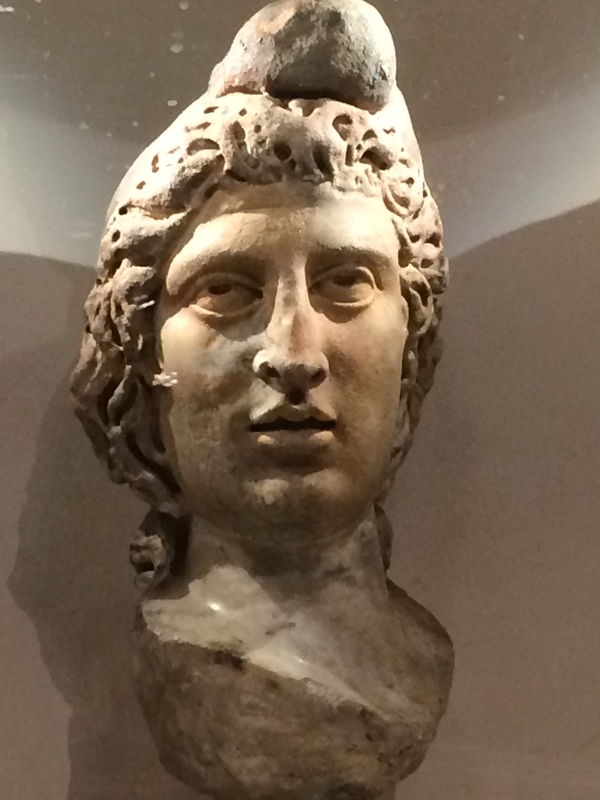 The marble head of Mithras – the god of heavenly light – and a range of other sculptures from the excavation are now housed in the Museum of London contains. The collection found at the site includes limestone altars, a bowl (both used for Mithraic rituals), columns and a marble scene depicting Mithras slaying a bull. 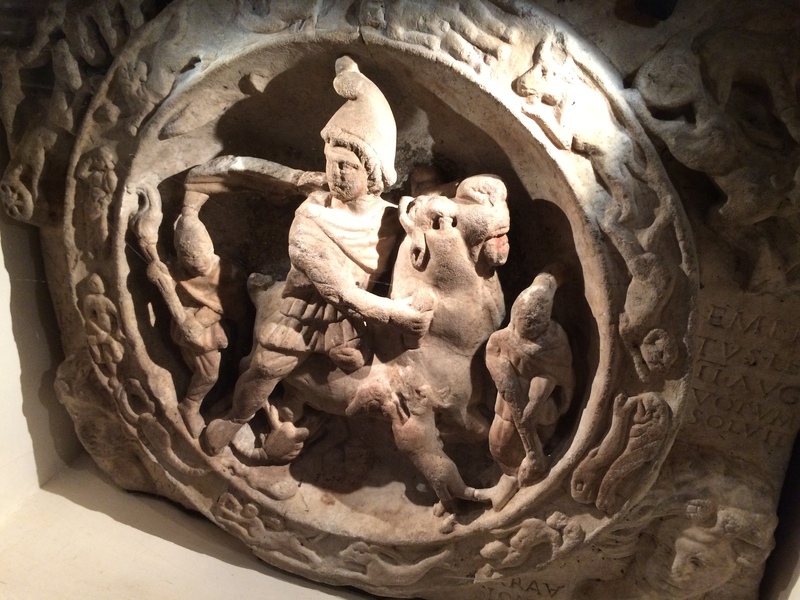 Marble scene depicting Mithras slaying a bull. In later Roman London, Christianity was the main religion. But no Christian churches from that period have been found by archaeologists as of yet. Archaeologists have found the area on the banks of the lost Walbrook to be fertile ground for unearthing Roman artefacts in recent years. The stream divided the two hills that dominated Londinium, St Paul’s and Cornhill. Higher ground has been reduced and valleys have been filled in over the years, but the latter can still be seen in the shape of a street called Walbrook, which runs past the new Bloomberg development. At Londonium’s peak, the Walbrook was an important source of water for use in the city’s thriving industry. And many ordinary Londoners lived on the banks of the river. Back in 1869 an amazing mosaic was found in Queen Victoria Street, near Bank station, attracting 50,000 visitors. It now forms the centre piece of a mocked-up dining room of a desirable residence in the Roman gallery at the Museum of London. Given the richness of the finds unearthed as part of the Bloomberg project, archaeologists have billed the dig as the “the Pompeii of the north.” The dampness of the lost Walbrook has helped preserve more 10,000 artefacts and an entire streetscape which have revealed new details about everyday life in Roman London. 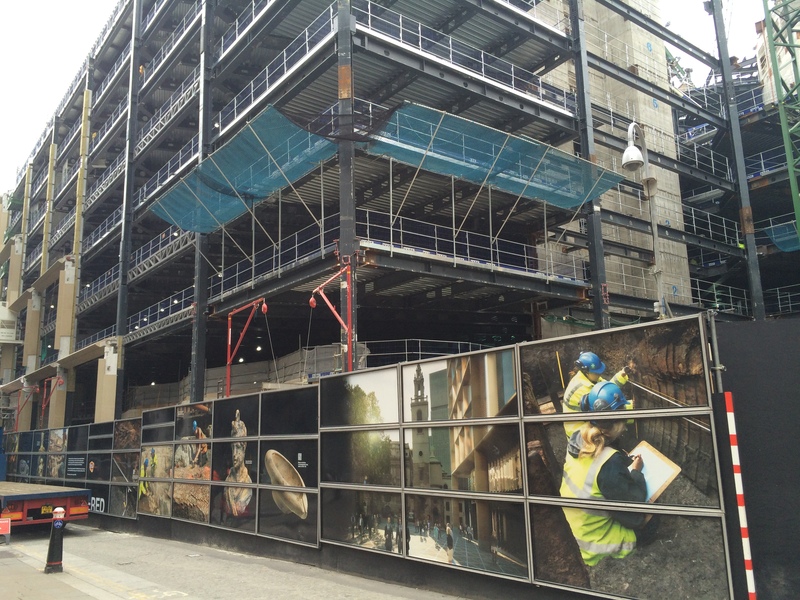 Pictures of some of the items found have been displayed on the hoardings surrounding the Bloomberg development site. “Why the site is so incredibly important is the quality of the preservation of the archaeological finds that are normally lost or decayed on other sites,” said Sophie Jackson from MOLA. 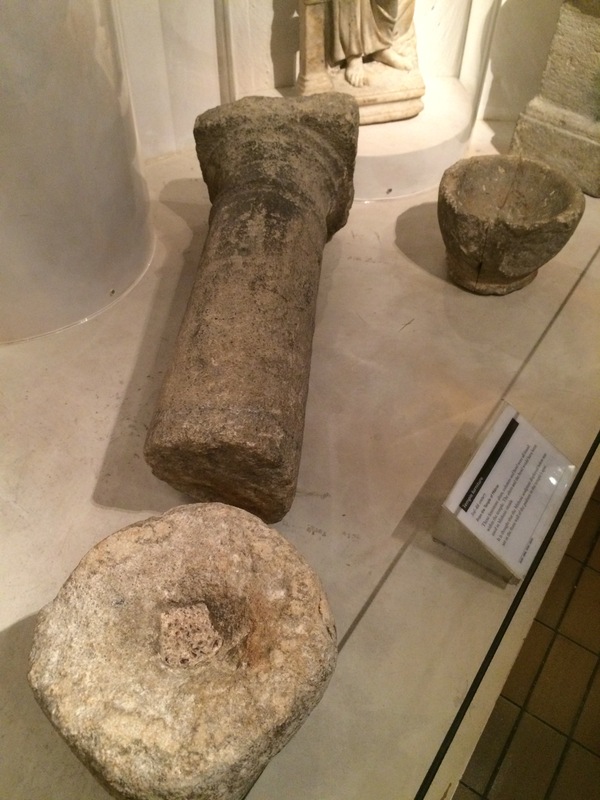 The artefacts found included a Roman door, wax tablets containing written records (perhaps with names of Roman Londoners), good luck charms in the shape of phalluses and fists and a piece of leather that could have been part of soft furnishing. In the most recent dig archaeologists found even more of the Temple of Mithras. By 250AD the Walbrook had become polluted and silted over. And in subsequent years it was built over. But now with the construction project at Bloomberg Place, we are getting to see afresh fascinating glimpses into life in Roman London. Collection found in 1954 at Mithras site included limestone altars, a bowl (both used for Mithraic rituals) and columns.